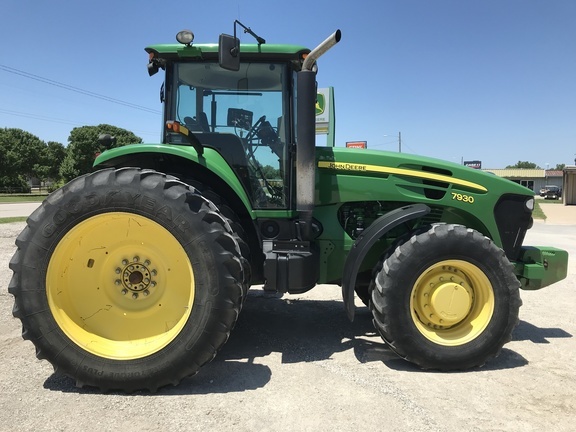 2007 John Deere 7930 Tractor, MFWD, IVT, GS ready, Guidance Ready, 1000 PTO w/540/1000 PTO capable, Deluxe CommandView Cab w/CommandArm & Active Seat, Deluxe Comfort pkg., Four Deluxe Rear Remote Cylinder Control Valves w/Electro-Hydraulic controls, TouchSet Hydraulic Control Panel, 45 GPM Hydraulic Pump, 480/80R46 Rear Tires, Duals, 420/90R30 Front Tires, Front Fenders, Extremity Lights, Field Vision Xenon HID Lights, AM/FM WB Stereo, Engine Block Heater, 8 front weights, rear wheel weights, Trimble CFX-750 Display w/EZ-Steer Assisted Steering System, plus all other standard equipment. Always shedded! Excellent condition!